Some online sellers are offering people free goods in return for positive product reviews, an investigation by consumer group Which? has found. Its investigator joined several "rewards for reviews" groups and was hired to write high-rated reviews in return for free items. Paid-for, or fake, reviews flout rules set by platforms such as Amazon and Facebook. A similar investigation by BBC 5 live uncovered the trade in false reviews. The Which? investigator found five sellers who gave instructions to order an item through Amazon, write a review and share the link, with the promise of a refund. 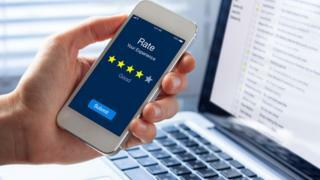 The investigator gave an honest review of the items, but in three out of five cases was not refunded because the reviews were not positive enough or the seller could no longer be contacted. The consumer group said that in one example the investigator gave a smartwatch a two-star review. They were told by the seller to rewrite it because the product was free, so it "is the default to give five-star evaluation". In another, the investigator was told that a "refund will be done after a good five-star review with some photo" after receiving some wireless bluetooth headphones. But after posting a three-star review with photos they were told they would not be refunded unless they wrote a five-star review. Impartial reviews - click on some reviewers and check their history. Do they give everything five stars? Responding to Which?, Facebook said: "Facilitating or encouraging the trade of fake user reviews is not permitted on Facebook. We urge people to use our reporting tools to flag content they suspect may violate our standards so that we can take swift action." Amazon told Which? : "We do not permit reviews in exchange for compensation of any kind, including payment. Customers and sellers must follow our review guidelines and those that don't will be subject to action including potential termination of their account." In April, BBC 5 live Investigates described how it was able to buy a false, five-star recommendation placed on one of the world's leading review websites, Trustpilot. It also uncovered online forums where Amazon shoppers were offered full refunds in exchange for product reviews. Both companies said they do not tolerate false reviews.